The South Beach Diet is certainly an alluring name for a diet, much more so than many of the more clinical diet names out there. South Beach conjures up images of beautiful people in revealing bathing suits, tanned and with rippling muscles, which coincidentally or not, is precisely how many people would like to appear! Appealing it is, but does it work? The South Beach Diet is similar to the Atkins Diet in that it puts the emphasis on protein, rather than carbohydrates which can pack on the pounds. The theory behind cutting back on carbs and eating a higher percentage of protein is that the body begins to have less insulin responses to carbohydrates. The South Beach Diet has three phases, during which dieters progressively add a few more carbohydrates back into their diet as they progress. The goal of the first phase of the diet is to eliminate the cravings dieters experience for all kinds of carbohydrates, including fruit, by eliminating them all together. Once the two-week phase one is complete, the cravings are supposed to have disappeared. By eliminating the blood sugar swings that accompany carbohydrate binges, the South Beach Diet aims to make dieting easier. Then, as 'good' carbohydrates are added back into the diet, the individual is less likely to lose control and binge. The types of carbohydrates allowed on the South Beach Diet are those that score low on the glycemic index. The South Beach Diet puts much more emphasis on eating fats that are good for the body, such as olive oil, which has been shown to raise levels of HDL, the 'good' cholesterol. Dr. Arthur Agatston, a cardiologist, gives the good fat/bad fat aspect of this diet credibility. The South Beach Diet book explains the difference between good fats and bad fats, making it clear to the layman. Unlike the Atkins Diet, the South Beach Diet does not encourage excessive consumption of saturated fats, such as those found in bacon, cheeses and butter. Instead, the focus is on monounsaturated fats and omega-3 fatty acids. South Beach counts carbs through portion size while Atkins counts grams of carbohydrates, which may be more difficult to keep track of. South Beach also allows for greater consumption of vegetables than Atkins, primarily ones that rank low on the glycemic index. Is the South Beach Diet Strict? Although it allows more fat consumption than some diets, that's not to say that quantities are unlimited. You will be eating quite a few salads, and will need to count out your daily allotment of almonds. In fact, if you do not enjoy eating mixed greens with a light vinaigrette dressing, the South Beach Diet may be somewhat tough for you. There is not very much room for flexibility, which can be problematic, if you are a vegetarian or vegan. The diet does call for quite a bit of protein, which includes chicken breasts, eggs and low-fat dairy. Breads are very limited and replaced with whole grain versions. The recipes, however, are quite delicious, if you have the time to prepare them. If you follow the recipes given in the book, you may not feel deprived at all. The South Beach Diet claims that those who adhere to it will lose up to seven pounds in the first two weeks, however, dieters should be aware that much of this weight loss is likely to be due to 'water weight' and probably will not last if the diet is discontinued. After the initial phase of the diet, weight loss is expected to slow to a reasonable one to two pounds per week. The South Beach Diet encourages dieters to exercise in addition to following the diet. Overall, if you enjoy eating meat and salads and believe that you can eat what is allowed in moderation, this may be the diet for you. 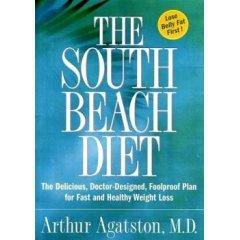 As with any diet, be sure to discuss the South Beach Diet with your doctor before you begin. Want to get recipe ideas or see what kinds of foods are on the diet? The following recipes are compliant with the South Beach plan. This Spaghetti Squash with Tomato Sauce recipe is compatible with South Beach Diet Phase 1. This dish is so good, you won't even miss pasta. With this recipe, you have the option of using a commercially prepared spaghetti sauce, but if you choose to go this route, read the ingredient list carefully to make sure sugar or corn syrup are not listed in the ingredients. Lay the squash face down in a baking dish containing ¼ cup water. Microwave about ten minutes or until tender. Heat the oil in a skillet and sauté the onion for three minutes. Add the rest of the vegetables and sauté until tender. Remove the squash from its dish and scrape out the spaghetti-like strands into a bowl. Pour the sautéed vegetables over the squash. Mix together all of the ingredients (except the chocolate chips) in a small bowl. Just before serving sprinkle the chocolate chips on top. Another great variation of this recipe is to use instant coffee for a mocha flavor dessert. Simply grind the instant coffee into a fine powder using the bottom of a spoon and use it in the recipe in place of the cocoa. Thoroughly mix the eggs and water in a bowl using a fork or a whisk. Lightly coat a frying plan with the cooking spray. Once the egg is set, spread the cheese, mushrooms and asparagus onto one half of the egg. Using a spatula, fold the other half of the egg over the cheese and vegetable filling. Place the omelet onto a plate and serve. Simple and delicious, this low carb Chicken Cordon Bleu recipe is sure to become a favorite. 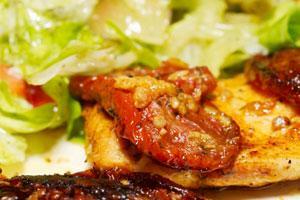 Pound chicken breasts until they are about ½ inch thick, or thinner, if you can manage. Place the Canadian bacon on each breast. Add one ounce of Swiss cheese on top of the bacon. Roll up and fasten together with a toothpick. Mix the olive oil and the egg together. Dip the chicken breast into the mixture. Roll in Parmesan cheese and place in a well-oiled baking dish. Bake at 350ºF for 30 to 35 minutes. Serve this nutritious Black Bean Salad for lunch or with dinner. Roast peppers in the oven until blackened. Peel the roasted peppers and then chop into half-inch squares. Place the beans in a bowl. Thinly slice about one third of the red onion and use as a garnish. Cover and refrigerate for at least 2 hours to let the flavors blend together. The grapefruit adds a light citrus taste to a traditional chicken salad favorite. Heat ½ tablespoon of the olive oil in a frying pan. Cut it into slices approximately ½ inch thick. Place 2 tablespoons of the olive oil, vinegar, onion, salt and pepper in a bowl and mix thoroughly. Pour ½ of the dressing over the chicken pieces and toss lightly. Place the lettuce (or mixed greens) and grapefruit sections into a bowl. Add the remaining portion of salad dressing and lightly toss. Place the sliced chicken on top of the lettuce and grapefruit to serve. Served as a snack or as a side dish, sweet potato fries are easy to make and taste delicious. Slice the sweet potato into approximately eight long strips by cutting it lengthwise. Mix the olive oil, salt and paprika together. Toss the sweet potato slices with the oil mixture. Place the potato slices in a single layer on a baking sheet. Bake approximately 15 minutes until the bottoms of the potatoes are lightly browned. Turn the potato slices over. Bake approximately ten more minutes until the sweet potato fries are tender.